Could Sustainable Aquaculture Be The Answer To The World's Growing Hunger Epidemic? Aquaculture is a pretty broad term. Generally, it refers to rearing aquatic plants or animals and applies to anything from having a fish tank at home to mass producing kelp. Its broad terminology means that many things that are classified as aquaculture aren’t, like keeping goldfish, and that can cause data on the subject to become a bit skewed. For now, we’ll focus on aquaculture that’s being conducted on a broad scale, similar to the difference between having a backyard garden and owning thousands of acres. For decades, the oceans seemed so vast and so plentiful that it was hard to imagine that any human activity could ever impact them. The more recent decades have shown us just how wrong we were to think like that. Massive amounts of plastic have inundated our oceans. Climate change has already begun to alter the temperatures, over-fishing has pushed many species to the brink of extinction and pollution has reached new highs. But despite all of that, many people and entire populations still rely on the oceans. And more are working on ways to save them. 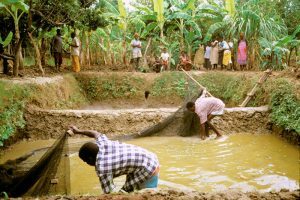 Expanding sustainable aquaculture in a village in Malawi. The idea of sustainable aquaculture is to try and continue using the oceans in a way that will allow them to flourish. Just like pretty much any other sustainable idea, this seems great! But there are hurdles that come with working in the water that other, drier operations don’t have to contend with. Pollution works differently in water than it does on land. There, we have to worry about how pollution may seep into underground waterways or become airborne. In the water, once it’s in there, it’s almost impossible to contain. Since the draw of fish farms is that they can be built in virtually any body of water, that also means that almost any body of water can be contaminated. There are two main types of pollution from fish farms — waste and uneaten fish food. The impacts of these things can be severe, especially if the farming is done with non-native species. The more fish there are in a small area, the more concentrated the waste products will be. While normal fish excretions are sometimes even beneficial for the environment, waste from the farms can be incredibly harmful. These close quarters are also suitable conditions for the fish to spread diseases and parasites, which in turn, can spread to wild populations. Chemical treatments are often used as well, both to encourage a favorable harvest and to keep growing populations healthy. These are usually geared toward a specific species and can be harmful to wildlife. In this case, it’s unlikely that we will find a way to eliminate the pollution entirely. But what we can do is get better at repairing the water. Microbes can be used that eat up or neutralize the harmful chemicals in the water with a process called bioremediation. This clean-up and maintenance is a key part of any sustainability program, but it becomes essential when talking about aquaculture. One polluted stream can contribute to the pollution of entire ecosystems. The types of fish that are introduced can also be problematic. Fish farmers use fish that are popular, and these aren’t always native species. When it’s done in open water sources, there is still a chance for some of the farmed fish to escape, which can create an opportunity for invasive species to propagate and overwhelm natives. Farmers can, of course, try and limit themselves to native species but that’s unlikely to result in steady profits. This is a problem which has been around for as long as people have tried to farm any non-native species, and it always results in the same outcome. In this case, all we can ask farmers to do is to keep non-native farms contained on dry land, so there is a lesser chance of de-containment. The first and least avoidable problem is that you need a place to put your product. On land, this is often done with deforestation or building a large factory. Underwater, similar processes apply. This results in the same issues you see on land, that native populations are forced to relocate. However, there’s another problem with this process – sound. Sounds travel much farther underwater than they do on land. On land, we worry about light pollution but underwater, sound pollution is a much larger issue. This is especially true for animals that rely on sound to communicate, like whales and dolphins. In the past century, the oceans have gotten noisier than most people ever thought possible. Construction, maintenance and work on one underwater plant won’t contribute too much, but an entire industry is a different deal. The noise generated underwater has already had detrimental impacts on animals. Whales have been forced into smaller and smaller habitats, similar to what we see on land with deforestation. Airgun surveys can completely devastate areas and wipe out native populations based on noise. The louder the oceans are, the worse they become for marine life. While fish farming is probably the most popular form of aquaculture, it’s not the only one. Corals are also being farmed for aquaculture, and kelp farms are being set up to try and expand ecosystems as well as de-acidify the oceans. Spots all over the world have been set aside as areas to conduct experiments in to monitor and try to regrow native populations, with no intention of selling the marine life off. Sustainable aquaculture is doable, and it’s something we can work on now. But not if we continue to ignore the issues we’ve created in the past. Trying new things is the only way to make any profitable aquaculture genuinely sustainable. Emily is the editor of Conservation Folks. 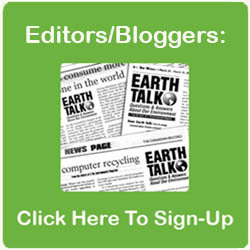 She writes on topics of sustainability, conservation and green technology. have tried to farm any non-native species, and it always results in the same outcome. In this case, all we can ask farmers to do is to keep non-native farms contained on dry land, so there is a lesser chance of de-containment.